For little kids, it doesn’t get much better than Mickey waffles, ice cream sundaes and a chance to goof around with Disney Junior pals. At Disney Junior Play ‘n Dine at Hollywood & Vine (located in Disney’s Hollywood Studios®) kids can do just that. Sofia the First, Doc McStuffins, Roadster Racer Goofy and Jake the Never Land Pirate join in the fun in a lively setting just right for little ones. And don’t worry, frittatas, omelets and fruit are on the menu to balance the insanely indulgent ice cream concoctions at the sundae bar. Disney Junior Play n’ Dine opens at 8 a.m. daily for breakfast and reservations are highly recommended. And stay tuned for some exciting news about a new Disney Junior star who will join the Play ‘n Dine breakfast soon. 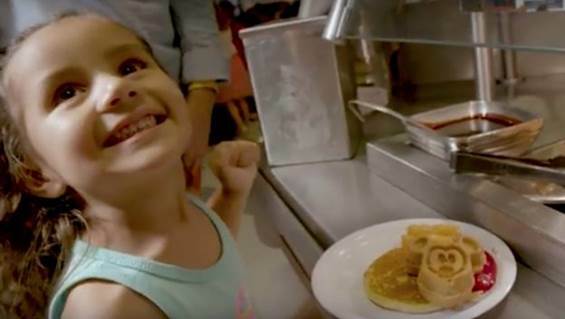 Check out this video for a look at what kids love about this popular character dining experience atDisney’s Hollywood Studios.